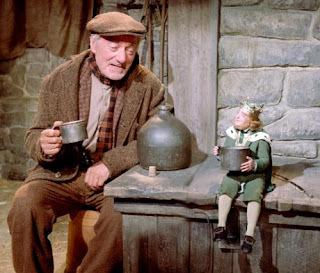 It’s “Saint Patrick’s Day” and to celebrate, I’ve got a wonderful little Irish gem called “Darby O’ Gill and the Little People”. It’s a 1959 family film, produced by Walt Disney (the man, not the company) and of all his live action family films, this is one of my favorites. 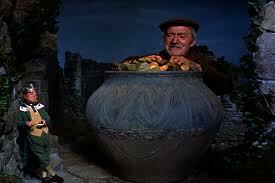 The film was based off a series of books called “The Darby O’ Gill Tales”, the primary story that this movie was based around was “The Ashes of Old Wishes”. If you’re looking for a good film to show your kids, this is one that I highly recommend. It’s imaginative, magical, entertaining, charming, has great characters and a really strong atmosphere. The plot centers around an aging caretaker named Darby O’ Gill, his master Fitzpatrick feels that he’s getting to old to take care of his estate so he has a young man named Michael McBride replace him. Feeling bummed about losing his job he heads home to tell his only doubter Katie the bad news. That knight, his horse goes crazy and Darby chases it up a mountain where he is captured by a society of Leprechauns and their leader, King Brian. 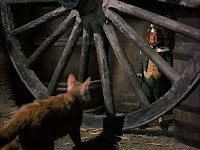 See, Darby has spent a lot of time trying to catch leprechauns and to prove that they exist but when he captured the king he took pity on him and now the king wants to repay him by sparing him the pains of his life and invites him to live amongst the leprechauns. The cast play their characters beautifully, Albert Sharpe is fantastic as Darby O’ Gill and Jimmy O'Dea is very enjoyable as King Brian. 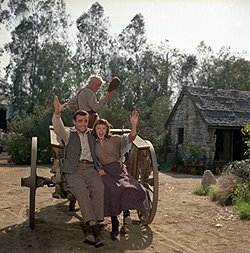 Also Michael McBride is played by Sean Connery, this was actually one of his very first films before becoming “James Bound”. The plot really isn’t what makes this film so great, it’s the magical atmosphere and likable characters that make it feel so refreshing. The main song of the film is “She is my dear, my darling one”, it’s a charming little musicale number and it’s the only time Sean Connery has sung in a film (so far as I know). 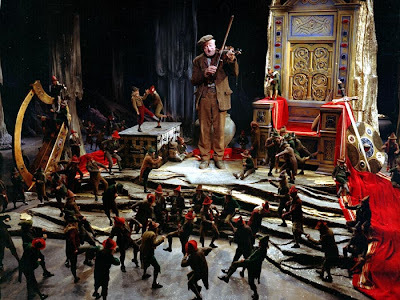 My favorite scene in the film is when Darby plays "The Fox Chase" for the leprechauns on a beautiful Stradivarius violin. It’s one of the most enjoyable musical numbers to be in a family flick. 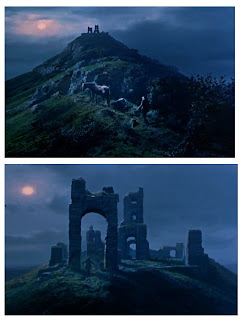 It all takes place in this big cave, the leprechauns pull off some cool stunts, they dance, they ride small leprechaun sized horses, its a huge highlight of the film and in all honesty, it’s worth renting just for this. Most live action Disney films like “Marry Poppins”, “Song of the south”, “Pet’s Dragon” and “Bedknobs and Broom sticks” have cartoon characters featured but this is one exception where it’s all live action. 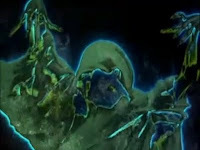 There are some riveting visuals, like when Darby first enters the cave and he walks amongst the leprechauns, it’s an amazing sequence that will just have you asking “how did they do that back then!” Now for every good effect, there’s also a really bad one, like this one shot of Darby falling down a hole. 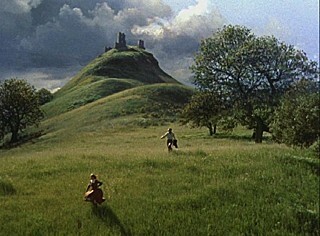 Overall, it’s a beautiful looking film, with breathtaking landscape and amazing sets. I especially love the locations at night, really creepy and it helps build up the atmosphere. Now while I said this is a great family film and highly recommendable, there are still some scenes that can get really scary for kids. The first two acts are so light hearted and colorful but then when we get to the third and final act of the film we get this nightmarish trip with all these ghostly apparitions, it couldn’t be more morbid. This is also when the film gets really good, now of course this is an Irish fairy tale, so we need to have a “banshee”, this is the big show stealer by far. For a creature effect from 1959, the banshee looks amazing, even to this day. She moves very gracefully, has long skeleton hands, most of the time her face is concealed under a hood but we do eventually see her face and when we do, holly cow is it cool. “The Banshee” is one of the big elements that make this film so memorable, there weren’t too many Disney movies at the time that featured something this creepy and awesome. 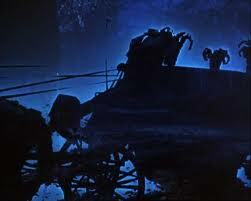 Also, there’s a spectral horse drawn carriage called “The Death Coach”, the driver looks like the Headless horseman, only transparent. You see, Darby’s doubter is sick with a fever and The Death Coach has come to take her soul to the land of the dead. I wish I could talk about the heroic deed that Darby dose to save her and how it connects with the Leprechaun king but that would spoil it, so let’s just say it’s a happy ending. Yeah, it does get a little dark but with all the Harry Potter films kids watch, this should be a walk in the park. Overall, this is a really sweet and really likable family flick, it’s not a flat out masterpiece or anything, it’s just really good and innocent by Disney standards. Just look at Disney’s family films now a day’s, “Bedtime stories”, “The Tooth Fairy”, “The Game Plane”, “The Pacifier” and “The Country Bears”. They all seem to be focusing on what popular actors they can get to look stupid in overly stupid predicaments. Not all family films today are like that but “Darby O’ Gill and the Little People” (and plenty other films) have a certain innocents and charm to them that recent family films seem to lack, if you haven’t seen it, then it check out, it’s wholesome family entertainment. I give Darby O’ Gill and the Little People 4 stars.